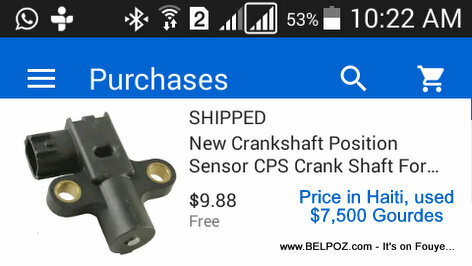 I went on eBay and purchased the part brand new for $9.88 us, FREE Shipping. Keep in mind, $7500 Haitian gourdes is roughly $115 US. The mechanic wants almost 12 times the price to buy it brand new plus I have no guarantee that the part will work. How did I get it to Haiti? Réparation automobile en Haiti - Un mécanicien demande 7500 gourdes pour une pièce usagée qui coûte $9,80 US neuf.